Presair’s foot pedal switch provides convenience and control when power switching. In this example, we explore its usefulness turning on a lighted microscope. Often times, a microscope is used in a workshop setting for closer inspections. This necessary process can quickly become annoying. Despite being in the middle of working on something, you now must scramble with dirty hands to find a small switch along the cord to turn the microscope on and then typically it gets left on leaving you with a burnt out light bulb. Although it’s a relatively simple task, it slows you down and adds a bottleneck to your workflow. Presair’s air switch (PBA-01) paired with a foot pedal (F800BA) eases the angst. 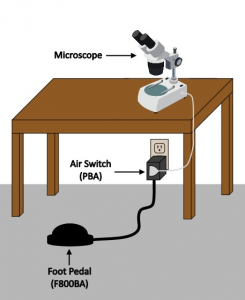 A footswitch can now be placed directly below the microscope or any other convenient place for quick control. Whenever you need to inspect something, just walk over and step on the foot pedal. The microscope is immediately ready to perform. No more setting things down, no more bottlenecks. 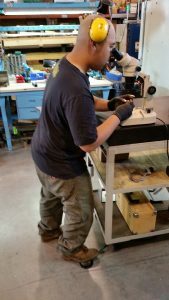 Additionally, despite the dirty and tough environment, a durable Presair foot pedal stands up to the harshness. Any improvements to your workflow add value. 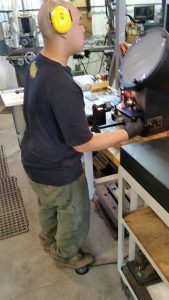 Presair’s foot pedals can improve the speed and convenience as you work. Although this example focused on a microscope, it can be used for anything that requires quick, hands-free switching. This simple yet helpful product can make a difference and lower production costs.